Enjoy your new Luxury Villa at Jackson Heights! 9′ Flat ceilings throughout the first floor. Painted kitchen cabinetry with granite counter tops. Your Owner’s Suite has a beautiful bath with extra storage closet and a 5′ tiled shower with seat and chrome framed shower door, and tiled floor! Laminate flooring will be in all your main 1st floor living areas. Your new 2nd floor has one bedroom, a full bath, and a walk-in closet with a hidden storage area. The large 2 car garage provides a pull down storage area and two remote garage door openers. 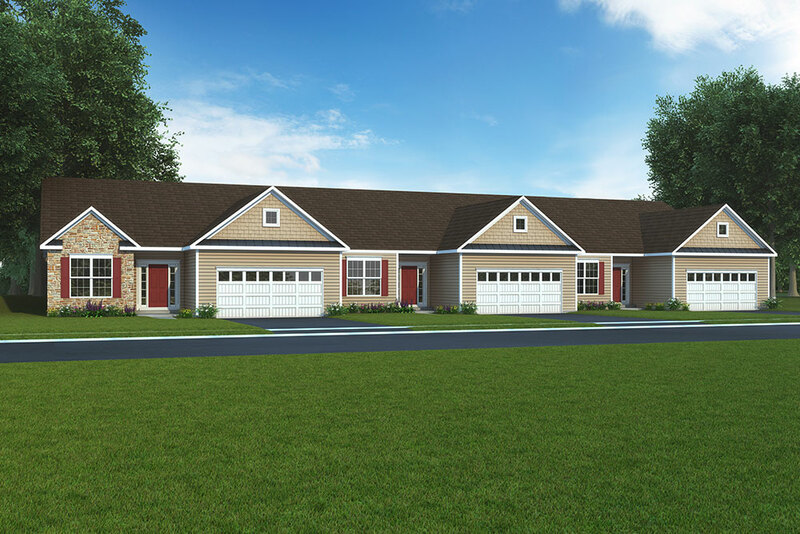 Marie Duplex Villa – Coming April 2019! Cherry Tree, a lovely 55+ community, embraces a more relaxing way of life while still maintaining the elegance and beauty you deserve. And when you build with J.A. 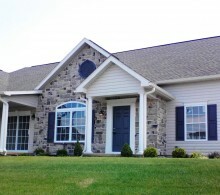 Myers Homes, you get to customize your home to ensure it lives up to all your standards. 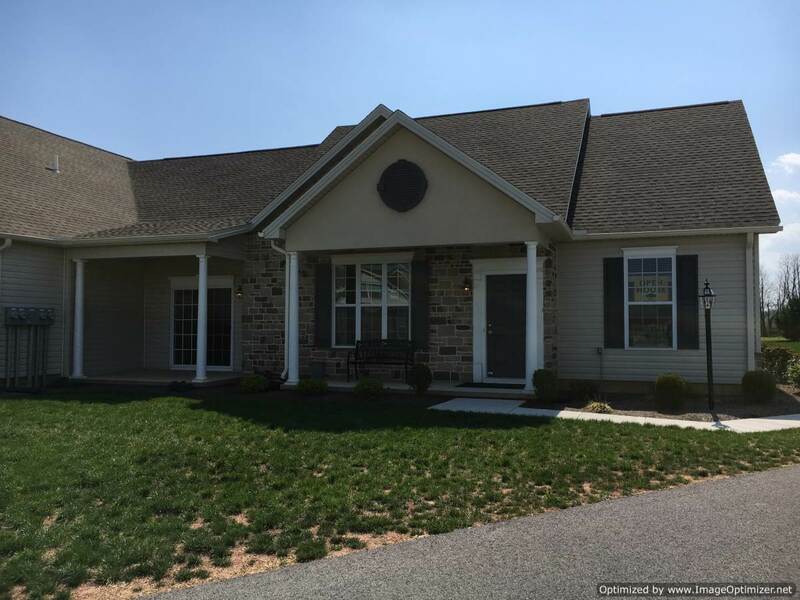 Embark on this exciting new chapter of life in Hanover, PA with J.A. Myers Homes today. Meant for residents 55+, these homes were thoughtfully designed for freedom, accessibility and peaceful living. All the amenities are located on a single floor, including an open-plan kitchen and living space great for hosting as well as the owner’s suite. Each home also comes with its own garage and driveway and boasts a touch of modern, versatile style everywhere you look. Not only that, but residents don’t have to worry about lawn maintenance. All lawn care and snow removal are completely taken care of for you. Condo Association covers most all exterior maintenance! Jackson Heights Villas offers one of the most unique designs in luxury one floor living in our local area! Exterior maintenance and quality construction in a quiet setting. 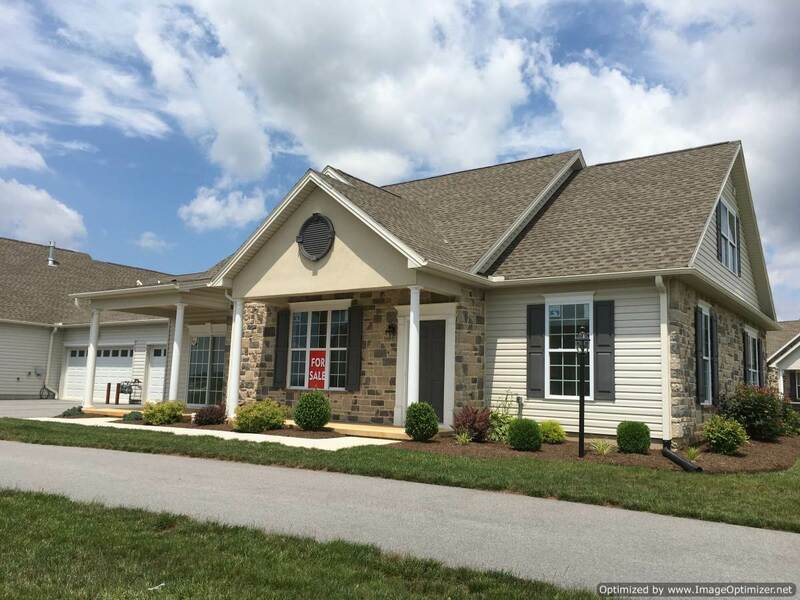 Our convenient location, public utilities, natural gas heat and beautiful partial stone exteriors, porch and patio are all standard for the large units. We include many upgraded features including cathedral ceiling or 9ft ceiling in living room , recessed lighting, granite kitchen countertops, selection of cabinetry, brushed nickel lighting fixtures, appliance package plus more. The large owner’s suites offers dual lit closets and an owner’s bath with separate soaking tub and walk in shower, double bowl vanities with right height cabinetry, 9′ ceilings, and ample cable outlets and reinforced outlets for the installation of fans. Stop by to see why the Villas at Jackson Heights is a cut above the others. New hours are Thursday thru Monday, 11-6 or by appointment. Call Bill Weeber for your tour! Price just reduced 2/23/19 on our home with the best view available! This villa will be full of upgrades! Our convenient location close to shopping, hospitals and recreation plus public utilities, natural gas heat and beautiful interior and exterior designs, set us apart from any other community. Gorgeous views, incentives and customized to your desire. Our standards are above what you would expect at these prices so take a look. Minutes from York! Take a peek at any of our designs by stopping in at the model and taking a tour. Affordable, custom and beautiful! Contact Bill Weeber for more information. Prices just reduced 2/23/2019! Great chance to get a good deal now. New design to this charming Villa and exterior cares are left to the professionals! Our homeowners love the amount of free time they now have while living here. Convenient location, public utilities, natural gas heat and beautiful partial stone exteriors, set us apart from any other community! Our neighborhood offers so much and is pet friendly for indoor animals. Great area to walk your pet, take a stroll and meet the neighbors. Condominium living in a unique design which offers many features others call upgrades. Live on the main floor and have the room for guests with a private suite on second floor plus extra storage. Come out, visit the model and see all the choices. We look forward to meeting you soon! Welcome to the Villa’s at Jackson Heights, where worries of snow removal and lawn care are left to the professionals! Our homeowners love the amount of free time they now have. 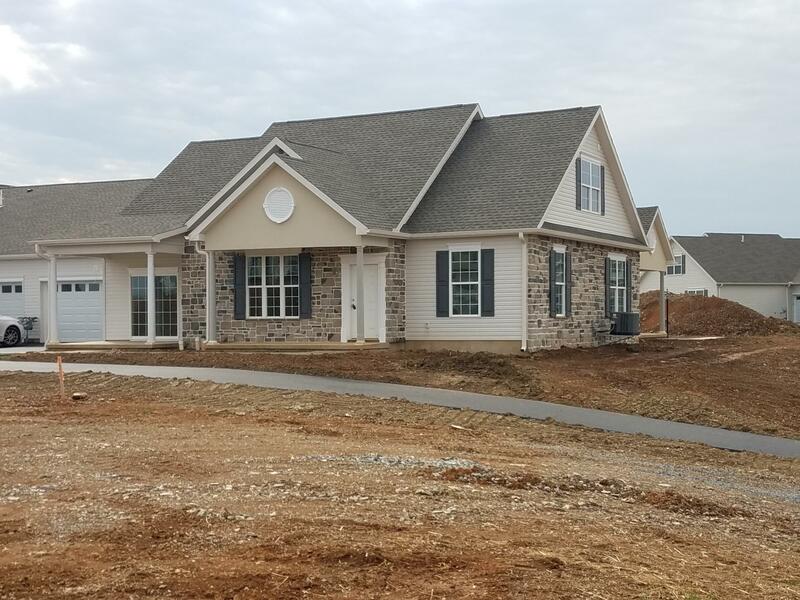 Convenient location, public utilities, natural gas heat and beautiful partial stone exteriors, set us apart from any other community! This lovely villa features cathedral ceilings with a cinderella balcony overlooking the spacious living room. 9′ ceilings throughout the remainder of the first floor, 36″ maple kitchen cabinets, granite countertops, ceramic backsplash and recessed lighting. Low maintenance wood flooring in all living areas. The owner’s suite includes dual lit closets and a super bath with ceramic tile and floors plus a separate shower with door. The large two car garage provides pull down storage area and comes with 2 remote openers. New Similar Villa is open from 11:00 – 6:00, Thursday thru Monday or by appointment, closed Tuesday and Wednesday. New luxury designs available and ready for you to finish your way. Take a tour of each and choose your favorite! Year End Reductions Going on Now! Price just reduced on this lovely villa with an amazing view! 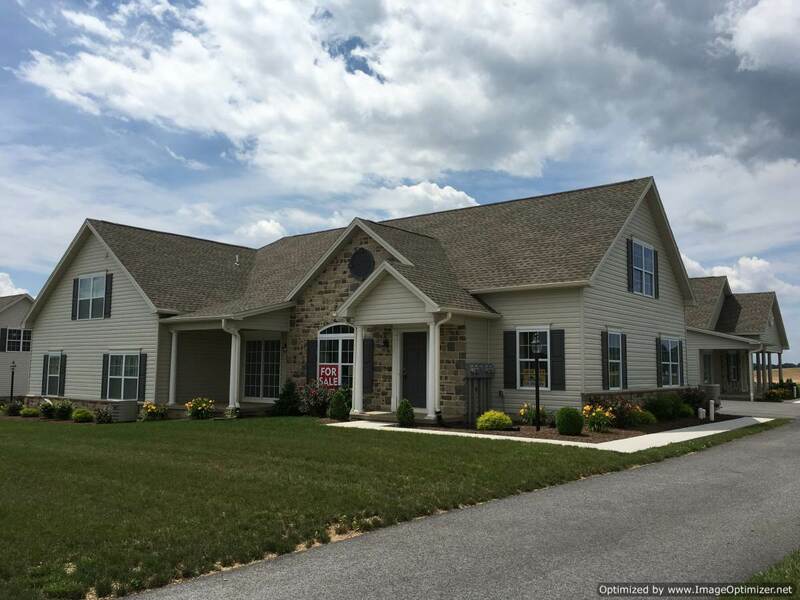 Finished to your desire with a bonus full covered porch and patio! Our homeowners love the amount of free time they have, not worrying with exterior maintenance. 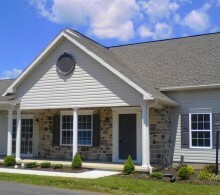 Convenient location, public utilities, natural gas heat and beautiful partial stone exteriors, set us apart from others. This quality built standard villa features a two car garage with opener, maple kitchen cabinets , recessed lighting and appliance allowance, living room with tray ceiling, hardwood foyer, dining area, large 2 car garage and much more. Painted and ready for the new homeowner to make the final finishing touches. This home is reduced for year end settlement! Stop by model for tour and details, 112 Dolomite Drive. Photos are of similar villa options only.